Automating mobile workforce management can allow insurers to increase efficiency and improve service levels. When business is tough, that’s a great advantage. In any industry, companies need an edge to thrive and maintain profitability. This is true in the property and casualty insurance business, which has become more competitive than ever because of broad economic and social forces. The past few years have seen the softest market in decades. At the same time, there has been increased pressure for better service from cus­tomers who have come to see insurance product offerings as largely commoditized. An escalating trend in the annual number of natural disasters only exacerbates the problems. More than ever, property and casualty carriers find themselves squeezed. Without having some way to reduce costs while improving service, companies can become the potential prey of their competitors. 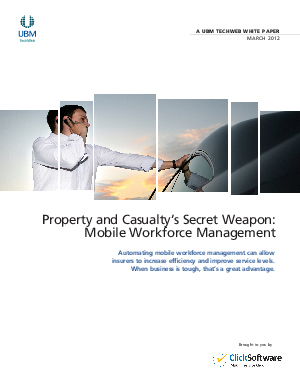 Mobile workforce automation is a secret weapon to help carriers to control costs. The property and casualty industry depends on mobile workforces, such as claims adjusters and appraisers, who have traditionally worked inefficiently. But a combination of mobile communications and streamlined work pro­cesses creates a powerful tool for insurers. When business is tough, that’s a great advantage.